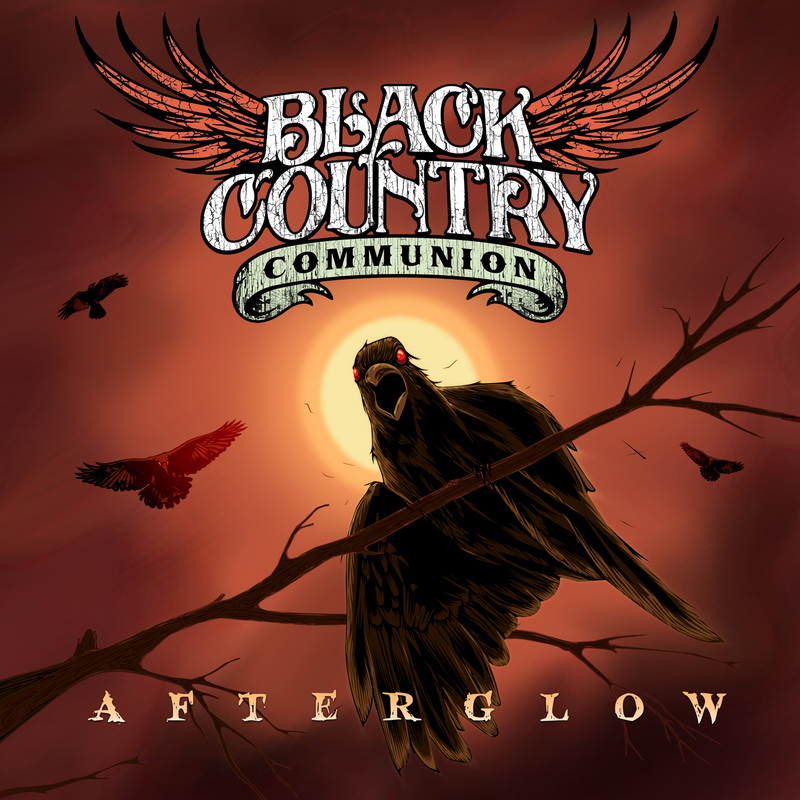 In anticipation of Black Country Communions 3rd studio album, Afterglow, I had aspirations of it being the best yet which would have been a hard act to follow considering how much I enjoyed the first two albums, Black Country Communion and 2. Maybe I got too excited, maybe I hyped it up too much in my head or maybe it’s just not a great album but I say this with a sad face, I was left extremely underwhelmed and quite honestly a little bored. It’s not a terrible album but like a parent, I’m not annoyed at the album, just disappointed. Black Country Communion are a current ‘Super Group’ made up of Glenn Hughes (Deep-Purple) on Bass and Vocals, Jason Bonham (Son of mighty John) on Drums, Derek Sherinian (Dream Theatre) on Keys and modern day guitar legend Joe Bonamassa who also contributes to vocals. Individually and collectively these guys have the talent and experience to produce some mind blowing music and for two albums, they did just that. I love this band, for the record, which is why it’s not fun to write negative things about them. They play the type of music that I wish I could create and the style of music that I missed first time around. For me, it’s a pleasure to hear a band playing classic rock in this day in age. Joe Bonamassa is one of the hardest working guys in Rock constantly touring and playing in and for countless bands and artists. Song writing clearly comes naturally to him. Glenn Hughes has been about forever which can clearly be seen by his tiny haggard face but great things do come in small packages and his bass playing and outrageous vocal range is testament to this. Why am I telling you this? The first two albums were written by these two men. When I heard an interview stating the other band members were now writing for this album I thought we might be running into trouble and I think I might have been correct. Unlike the first two albums, Afterglow doesn’t really feel like the complete package. Yes, there are a couple of stand outs on the album. I defy you to listen to “Cry Freedom“ and not bob along to its ZZ Top style guitar playing and groove or listen to “Confessor” and not get sucked in by its Led Zeppelin influences and stunning drumming from Jason Bonham but this is perhaps the problem, it all sounds a bit like a tribute album. Listen to the intro to “Midnight Sons” and you’ll be convinced it’s a song by The Who or the odd Stevie Wonder style breakdown half way through “Common Man”. On its own, I guess Afterglow could be considered a success but in comparison to the first two albums, it’s just lacking that certain something. Fans of the band I feel will be disappointed and people listening to the band for the first time won’t be particularly blown away so if you intend on listening to Black Country Communion, start from the bottom up. They are a Super Group in every sense of the term only slightly let down by perhaps releasing too much too soon. Like that ‘NEW IMPROVED RECIPE’ you so often see on the side of your favorite drink, you’ll probably prefer the way it used to taste. I, to cheer myself up, am going to go listen to the first two albums again as they are just about impeccable. Over and over again I find myself picking my face up off the floor after Mr Bonamassa has melted it completely off with guitar solos that range from funk and blues to almost heavy metal. I find myself clenching in harmony with Mr Hughes as he somehow hits notes that Mariah Carey would be proud of and I’m currently suing Mr Bonham for damages done to my neck from consistent bobbing. Derek Sherinian… umm… thanks for playing the keyboard? When I saw them live he played Van-Halens “Eruption” on keys… I guess that’s impressive. I haven’t heard the third album yet but I totally agree that BCC and 2 were utterly superb, I haven’t heard much new stuff in the genre that bands like Deep Purple and Led Zeppelin occupied and which seems to have been left in a void currently. I’m not a fan of modernesque rock – aka indie style lightweight stuff; yeah I don’t mind a bit of it every now and then, Keane, Coldplay… but I just don’t *dig* these bands like I did DP and LZ, and it’s nice to see people like this filling that void now. I’ve been too disappointed with music and it’s like a weight has been lifted off my shoulders to hear new “old”-style heavy rockin music like this. I just hope the rumoured spat between Hughes and Bonamassa is resolved and they go back into the studio soon. I want to hear more! Thanks for the review! Think that might be it for BCC for now unfortunately but maybe a break for a few years will do them soon good. The third album was maybe a little rushed. Some good music to look forward to this year.